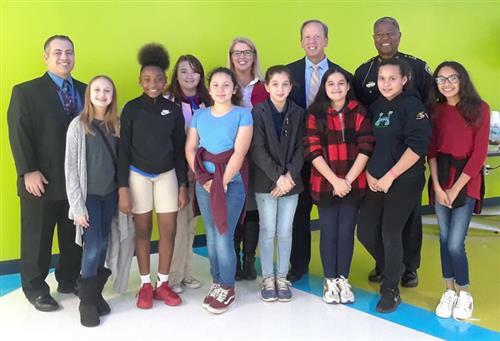 District, school and community leaders gathered at Bardmoor Elementary recently for a ribbon cutting ceremony that celebrated the completion of recent construction upgrades to the 80,000 square-foot campus. Clerestory skylights were added to the new community learning centers that were built, and visual sight-lines were provided throughout the building. This work was constructed over five phases so the school could remain open and minimize the construction’s impact on the school. Pictured: Bardmoor Elementary ribbon cutting ceremony. Pictured: Assistant Principal Mark Ruscetta, Principal Leigh Brown, Superintendent Michael Grego, Chief Luke Williams and ambassadors who were selected to give tours following the ribbon cutting.